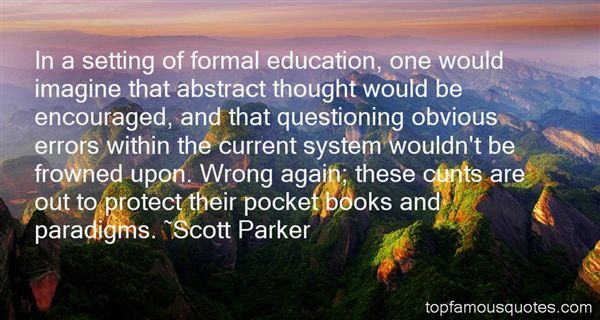 Reading and share top 1 Scott Parker famous quotes and sayings. Browse top 1 most favorite famous quotes and sayings by Scott Parker. You get that one chance; and damn it, you've got to take it! If there's one lesson I know I will take with me for eternity, its that there are those things that might happen only once, those chances that come walking down the street, strolling out of a café; if you don't let go and take them, they really could get away! We can get so washed out with a mindset of entitlement– the universe will do everything for us to ensure our happiness– that we forget why we came here! We came here to grab, to take, to give, to have! Not to wait! Nobody came here to wait! So, what makes anyone think that destiny will keep on knocking over and over again? It could, but what if it doesn't? You go and you take the chance that you get; even if it makes you look stupid, insane, or whorish! Because it just might not come back again. You could wait a lifetime to see if it will...but I don't think you should."